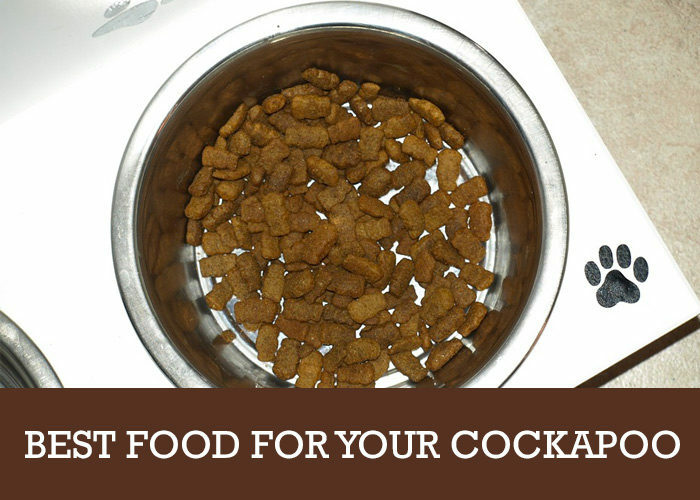 One of the most vital decisions you will make with regards to your cockapoo’s health and wellbeing is what you will feed your dog. As is the same with us, humans, diet can help make your dog’s health, or break it. How do you make this decision? There are so many choices, such as dry kibble, wet kibble, organic dog food, and natural dog food, and advertisers push different types of food, knowing that you love your dog and will be a good source of revenue for their business if you choose their brand. It all boils down to you to be educated on the best food for your dog, and that is what this article will assist you with. Biologically, your dog is a carnivore, so is supposed to eat mostly meat. It can survive on other foods, according to the latest research, but you want your cockapoo to thrive, so it is best to feed your dog a diet that features a lot of meat. The more meat in your dog’s diet, the healthier your dog will be. Vegetables, corn, and grains may serve as filler for your dog, increasing portion size and making your dog poop more. However, they will not make it any healthier and may harm your cockapoo. A lot of dogs are allergic to grains, and even some vegetables, so it is best to give it as much meat as possible. Dry kibble is great for easy transport and storage and can be used to feed your dog every day. Despite it being a spectacular invention, you must be careful what is in your dry kibble. It must have as much meat as possible. To know how much meat is in your kibble, you will have to read the label. If it says that it’s beef, bison or turkey, it means it contains 70% of that meat. If it’s something vaguer like ‘beef dinner’ or beef platter’, it only contains 10% of that meat. If it says ‘with meat’ it only contains 3%. Check for grains such as corn, and vegetables. A small amount of fruit and vegetables might be okay, but some dogs are allergic to these foods. The less filler there is, the better. If the label says ‘complete and balanced ‘, it has met AAFCD (Association of American Feed Control Officials) guidelines and contains all the nutrients in the correct amounts your dog needs. Always look for this label. If you see the complete and balanced label, it is a promise you can trust. Some foods are labelled ‘for small dogs’, or ‘for large dogs’. In this case, you should buy small dog food, as your cockapoo is small, and larger dogs will have different dietary requirements. The guidelines are similar for wet food. Pay attention to the label, the ingredients, and whether it says ‘complete and balanced’ or not. Wet kibble has a better taste so even picky eaters are more likely to eat it. It contains fresher ingredients, which might be why wet kibble is a bit more expensive. Also, you will need to refrigerate your wet kibble, so it is more difficult to store. When you pick your Cockapoo from a breeder, it will be used to a certain food that the breeder will have given. Follow what the breeder recommends regarding times of feeding, amounts etc. If you disagree with the brand, avoid giving your cockapoo a different brand instantly. Instead slowly and gradually transition from one brand to another. If you change too quickly, it can upset the dog’s stomach and lead to diarrhoea and vomiting. Free feeding is a bad idea at this age, as you are trying to house train your cockapoo. At four months, feeding your cockapoo four times a day should be okay. Feeding at strict intervals will help in managing when your puppy needs the toilet. Food branded “puppy food” is not recommended by breeders. It is often too high in protein, so might overly speed up development, and hurt its musculoskeletal system. A four-month-old puppy should be fed two times a day, on the same food it has always been given by you. This would be a good time to introduce bones. Raw bones are better for your cockatoo as opposed to cooked bones, as cooked bones are softer and might break and damage your cockapoo’s mouth. Some breeders recommend artificial bones, as they are not as dangerous and will satisfy your dog’s desire to chew. Bones are helpful when the puppy is teething. An adult (about 12 months) should be fed 1 or 2 times on the same food it was given since it was a puppy. Indications as to whether or not the dog is getting the right food include: Is the hair shiny? Is it healthy and happy? Does it have diarrhoea or vomit often? Is it energetic and playful? If your cockapoo is showing signs of nutritional deficiency, please consult your vet. If you need to use treats, use them to train your dog as opposed to just giving them as snacks. Commercially made treats are not good for your dog’s health. They are often packed with carbohydrates, which can affect blood sugar levels and cause obesity. In summary, it is best to buy natural dog food. Although your cockapoo can eat other food groups, it is best being kept on a diet consisting of meat. Whether you buy wet kibble or dry kibble, always get the brand with the most meat, and look out for the complete and balanced label. Do not give your cockapoo too many treats, let them have plenty of fresh air and exercise, and it will be healthy and happy. Should You Get a Dog Door for Your Cockapoo? 10 Must Have’s Before You Take Your Cockapoo Home!